CPTV will preempt regularly scheduled programming on September 13 at 10 p.m. for a special live event: Take a live tour of the wreckage from the USS Indianapolis, the WWII vessel lying at the bottom of the Pacific since its sinking in 1945. The program will also be available to stream live on PBS.org and on the PBS Facebook page. 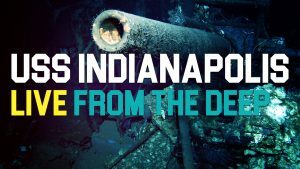 Hosted by Emmy-winning broadcast journalist Miles O’Brien, USS Indianapolis Live – From the Deep takes viewers through the wreckage of the Fifth Fleet’s naval flagship, which lies more than three miles below the surface of the Philippine Sea. The U.S. Navy cruiser was found and positively identified in August through careful analysis of wreckage and markings. On CPTV: Wednesday, September 13, 2017 at 10 p.m.